The new BMW 5 Series, launched a few months ago and in the UK for the first time, is really good. The odds on it not being so were always fairly slim. BMW, like a nation state fretting over the health of a high street bank, does not entertain the idea of its flagship exec failing. Certainly, it sells more 3 Series and probably makes more money from the X5, but the classier, capacious 5 Series is primarily intended for the industrial world’s wheel-turners, and that bespectacled mob of grease men know quality when they see it. The peachiness of this G30- generation 5 Series was recognised by the Car of the Year award from our sister mag, What Car?, in January. The expression worn by Matt Prior, who I met at Cobham services on the M25 to collect this very 5 Series as the world slept, only confirmed it; covering the 1700 miles between Casares in Spain and Cobham in the car had scuppered neither the smile nor the posture of Britain’s premier road tester. So the 530d, as blue as the mesosphere and uncommonly big in the wheels, is very decent indeed – perhaps even great – but it cannot yet claim to be best. 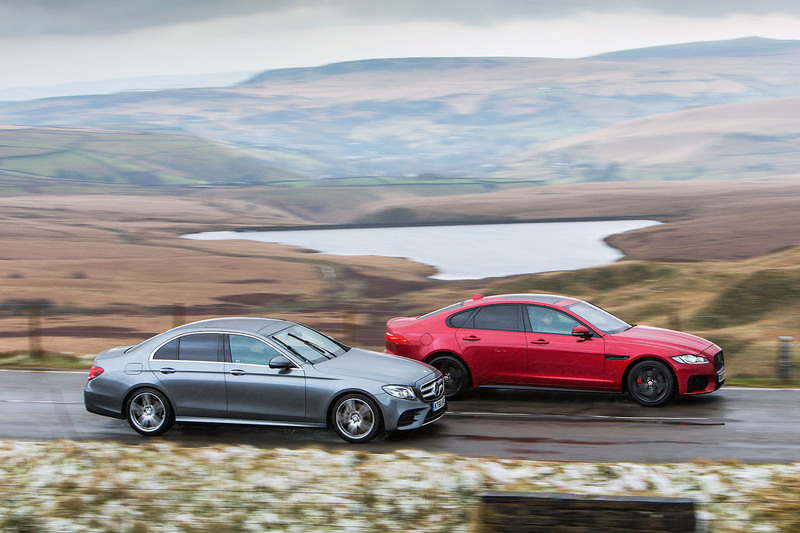 For that, its ascent must overcome two spectacular overhangs: the W213- series Mercedes-Benz E-Class and second-generation Jaguar XF. The first, as grey as a monsoon and wearing an E350d badge, is the oldschool benchmark of taste, albeit one now with enough circuit boards to model climate change. The second, plum red and from our long-term test fleet, is along for an even more obvious reason: it drives with the full-fat sweetness of yesterday’s lardy cake. The BMW, replete with xDrive in this case, must marmalise both the silicone and the sugar if it is to march onto the podium’s top step. Moreover, it must do so in the coalface ugliness of Monday-morning Britain, where it is raining and exasperating. The BMW is 245 miles away from where it needs to be, which is Yorkshire. Where it is snowing. The quickest way for any car to assuage real-world awfulness is with the escapism of a lovely interior – and with £775 worth of white nappa leather stitched into the new 7 Series-derived cabin, the 530d cushions the thought of a four-hour commute well. Big-skinned but not overtly big, it is credibly, caddishly handsome and, although digital in its numerous displays, it remains gratifyingly analogue in the right places. Unlike its rivals, it has knobs for both temperature and volume, plus a dirty great obelisk with which to select gears. The E350d, bolstered by a £3895 Premium Pack, has a deeper lustre and possibly more visual imagination, although with almost a metre of floating black fascia dominating the dashboard, it doesn’t properly segregate the driver from other distractions; a failure underlined by the irksome placement of the controls for its Dynamic functions on the wrong side of the centre console. Jaguar, sticking resolutely to its touchscreen doctrine, has the room to make such fun-orientated dynamic features pleasingly accessible, but there’s a screen-stabbing sacrifice to go with everything else and a studied sombreness to the XF’s layout. The 530d nails its BMW bullet points: the steering wheel is as fat as a full-grown ferret; its seemingly huge, powered, heated front seats (part of the £2170 Premium Pack) are clouds of candy floss compared with either rival’s; the iDrive remains intuitive and unburdened by air-con controls, and there is no better head-up display – even if this, too, is part of a £1495 Technology Pack. Rather too much about this particular 530d requires sticker price qualification, but not its 3.0-litre oil-burner – and it is the bi-turbo straight six that continues to fill out not only the nucleus of the car’s famous badge but also what it does well. Not dissimilar from the Mercedes or Jaguar, this is about convincing you that six cylinders are an unequivocal improvement over the modesty of four. Diesel may well be on the down slope of its popularity, but the tractability and accelerative largesse of a contemporary 3.0-litre lump isn’t likely to go out of fashion any time soon, especially when traversing the whole M40 and half of the M6 in the same morning. Consequently, there is no real loser in this old rogue’s gallery: the E350d’s OM642 V6 may have a solid decade’s worth of heritage behind it, but so does the AJD-V6 that Ford still builds for Jaguar. Like veteran artillery pieces rolled back onto the range, neither struggles to zero in on the primary target. The Merc V6 is saved from its own syrupiness by the 9G-Tronic transmission’s intangible, intelligent rummaging for a peak torque band only 800rpm wide. The Jaguar’s V6 has 516lb ft to call on once its eight-speed ZF gearbox has woken up – with a clear 41bhp supremacy at a lustier 4000rpm. Both, though, are potent and huskily likeable. 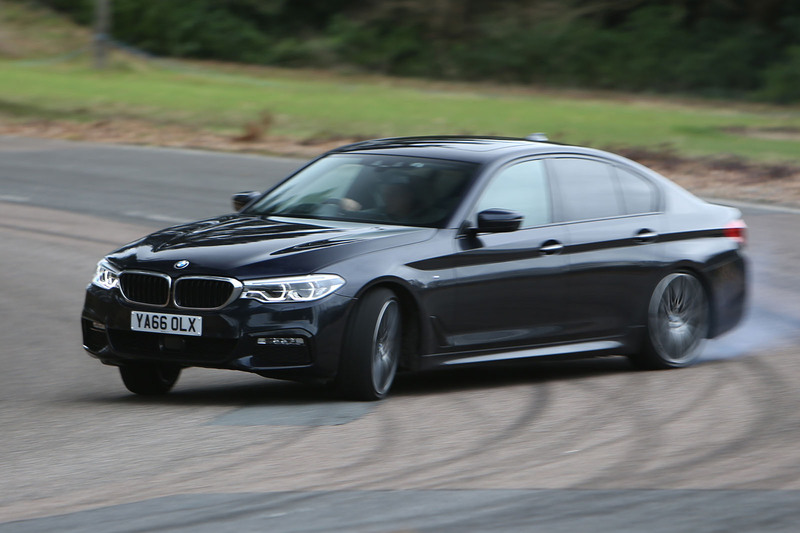 The 530d is down on power to the XF, too, and has one gear ratio less than the E350d. Neither fact is noticeable, though. The BMW finds the right ratio at least as adroitly as the Mercedes and is even better than the Jaguar at going from a flat-toned glide to the soft growl of proper rapidity. The reasons for this are manifold. Its own eight-speed ’box feels about three or four GCSEs cleverer than the XF’s and tends to lock up quicker. Additionally, this BMW has a driven front axle to share the 457lb ft of torque (contributing mightily to its speed away from the mark in the prevailing conditions). Lastly, the B57-designated straight six, introduced just last year, could reasonably be called state of the art. The marketable upshot of its newness is fairly marginal top-of-the-class efficiency, but eyeball deep in fast-lane spray, it is the powertrain’s brio and well-oiled meticulousness that tallies with the assured way the 530d cruises. In the E350d, although there is a choice of five drive modes, Mercedes is chiefly concerned with hermetically sealing you in ‘Comfort’. Multi-chamber air suspension ensures languid, long-wave vertical motion; the kind of lilting response that hardly accounts for the furrow you’d think was being left behind by the car’s stability-biased electric steering rack. There’s no unfeeling centre to the XF’s straight-ahead: it’s as minutely accurate as a horse’s reins and befits the phlegmatic swell of Jaguar’s chassis poise. The 530d, though, is better insulated than either and, despite M Sport lowered suspension and 20in wheels, is no less de luxe in the long stride of its own rolling refinement. Arguably, it harmonises a positively weighted, lane-change assurance and primary ride imperturbability best of all. Add the B57’s secluded aplomb, the cat-swinging space that seems to orbit the soft-edged driving position and the iDrive’s mostly instinctive menu system, and its real supremacy is the lack of fatigue experienced by its driver. A capacity for tirelessness is plainly useful if your occupant is required to go all hard sell or bluesky at journey’s end or, in our case, launch headlong at a well-lubricated strip of English B-road vertebrae. This is Sport+ country; in sight of the M62 but a happy world away from its unswerving drudge. This route, the old way from Rochdale to Huddersfield, still winds capriciously around hills and reservoirs and occasionally slams shut for bad weather. We really ought to be here three months hence, when you can see for a dozen miles into its vales, instead of now, where visibility is limited by the ominous swirling of a weather front over high ground. The E350d, as laid-back as a marinating hippo and probably half a tonne heavier, ought to be out on its feet up here. But in fact the car does a stand-up job of reminding you that its shag-pile pliancy is not necessarily pudginess. Charge the air suspension with the prioritising lateral body control and its flaccidity recedes under duress. The manufactured flatness engenders greater confidence in the car’s ability to work at a higher tempo; a new-found level of faith that it rewards with a commendable amount of grip. Its failing – more an inescapable truth than a shortcoming – is that there’s no way for Mercedes to suddenly plumb invigorating depth into the sediment of all that preceding imperiousness. Button pushing causes unrealised muscles to tense, but there’s no more blood getting to the desiccated steering, nor any suggestion that the air-breathing chassis is about to go all live wire. This steadfast consistency would probably stand the E350d in better stead if it weren’t forced to play backdrop to the XF’s sensory pay-off. There’s no muscle tensing required here: the Jaguar simply unfurls itself from motorway duty and sinks its P Zeros into the tarmac’s knotted jugular. It doesn’t seek to hide its 1750kg kerb weight under electronic restraints. Rather, the XF juggles it judiciously, rolling it around some unseen linchpin like a speed skater gamely stooping for a turn. The real triumph of the tuning, though, is to make this endless transference of mass seem effortless to a chassis still endeavouring to soak up endless road surface imperfections along the way. At this, alongside the job of grafting on a riveting and responsive steering rack, the XF is unparalleled. For all that, though, the Peak District doesn’t do it many favours. As the rain turns inexorably to sleet in a sub-zero cloud bank, the Jaguar’s tendency to rotate on demand (or not) becomes progressively less appealing. Finding the window of opportunity fractionally ajar, the four-wheel-drive 530d waltzes clean through it. 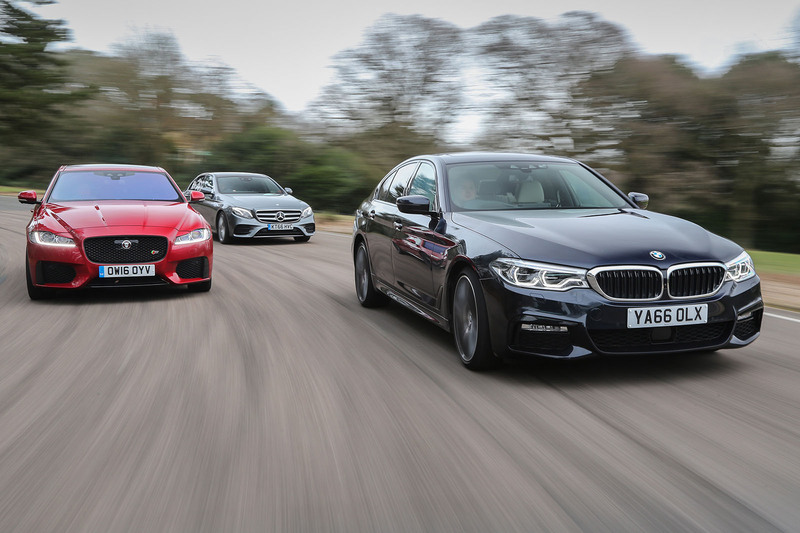 BMW’s characteristic achievement is to grasp the E350d’s polished and very Germanic sense of dependability and filter it through the same driverfocused prism that instructs Jaguar. So although the car doesn’t precisely emulate the suave, feelsome agility of the XF, it hunkers down perceptibly better than the Mercedes on its own adaptive dampers and starts to push back at you through the emphatically fast steering column. It, too, relies on its Sport button – although less for body control and more for access to the engine’s gutsier setting, where the straight six suddenly reveals its marginal advantage on the motorway to be as clear cut as the Panama Canal expansion. Liberated by far livelier throttle response, the BMW goes from placid moocher to something far more hardedged and fast-revving. Moreover, of course, none of the extra enthusiasm dissipates through a single axle. On turn-in, there’s a sinewy confidence in the nose that could only originate from driven wheels – yet the xDrive system rarely settles for a benign cornering attitude, the tangible shuffling of power to the rear providing gratifying evidence of the importance BMW places not only on the sensation of being pushed but of verve and balance and poise, too. Sure, there’s not the overt playfulness you’ll find embedded marrow-deep in the XF’s chassis, and the optional 20in wheels ultimately stifle the 530d’s wheel control on the bittier patches of asphalt, but the xDrive drivetrain and lower M Sport suspension allow you to carry more speed than in its rivals and confirm the idea of the car as a supremely able, all-court competitor. It is the concept of completeness that makes its rivals’ comparative talents so much harder to enthuse about in retrospect. The E350d is richly appointed, as clever as a moon rocket and utterly sure of its lushness, practicality and comfort. But the 530d makes its certainty seem overwrought and, on deserted country roads, a mite one-dimensional. If anything, the XF’s slight lack of overall polish, particularly inside, is even more transparent in the BMW’s company – even if its infallible driver focus leaves it better able to soar above its shortcomings. The Jaguar is the only car in the class capable of driving with the keyed-in feel more often attributed to the compact exec class below. Were the winding roads of the South Pennines a more widespread feature, it would be among the world’s three or four best five-door commuting options. But this isn’t a diorama. Pull back from the Peak District peephole, and despite exceeding the new 5 Series memorably in places, the Jaguar doesn’t measure up to the broadbatted job done by BMW here. The XF isn’t quite as good-looking, as accommodating, as well finished, as efficient or as overtly sophisticated as BMW’s rakish effort. Nothing this size is. That it also manages to be strikingly good to drive when it needs to be and soothingly agreeable when it doesn’t confirms the 530d as the multi-purpose big diesel class leader we thought it might be. So is someone telling porky's about power / weight? Jag shd be clearly quicker, given it's torque and power surplus, and it's mid-ranking weight. ...will have an effect too - torque at the wheels being more of an effect on acceleration than at the back of the flywheel. The MB's first handful of ratios are fairly closely stacked, which probably allows it to scoot off the line with some alacrity. 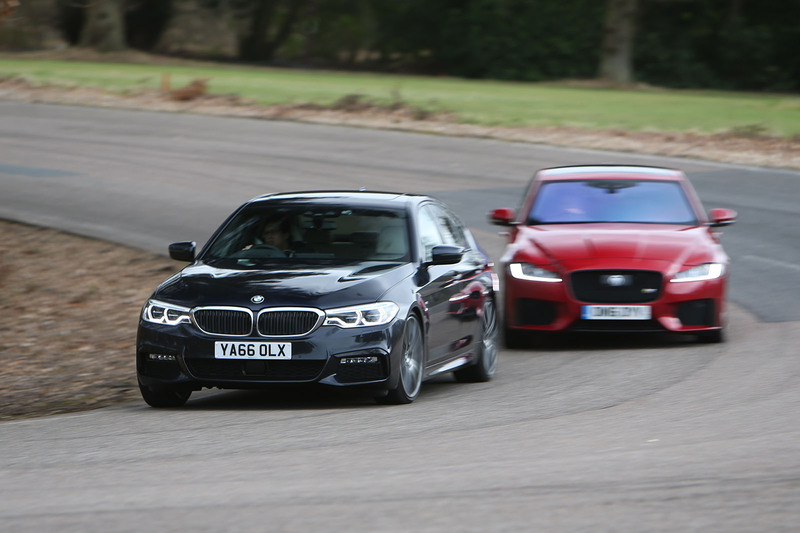 The reviewers must be doing a April fools prank with this article because there is no angle or side from which the BMW looks better then the Jaguar. Either that or he needs to renew his subscription to Specsavers. The Jag objectively looks middle aged from the side. The Merc is elegant, and the 5 does have an element of athleticism. Only your eyes are fooling you if you think the Jag is the best looking car. The previous XF looked prettier to my eyes. The Mercedes looks middle aged from all angle and you a definately in the minority for thinking the Jaguar doesn't look the best here. Mercedes looks chinsy with all that chrome and the BMW looks nothing new compared to previous BMWs. Yes the Jagaur is not massively different from the last but it look much better proportioned then the previous gen. I PREFER THE Xf ON LOOKS but look forward to see what it will be like with the new straight 6 although the current v6 is a great engine the same as in my RRSPort te new six will be more powerful, lighter and lower centre of gravity to will be significantly better. I think the XF is the looker of the trio but whoever signed off the interior should be looking for alternative employment. Maybe Samsung's refrigeration department is looking for a new head of design. Boring in the extreme and stylish interiors are surely one of Jaguar's main selling points. No Samsung HR executive in his right mind will ever hire such a drab talent, believe you me. From the side the XF looks just drab, and no amount of body cladding or black wheels can disguise it. The 5 actually looks best in non-M-Sport guise. And with 19" wheels it would have creamed this test even further.